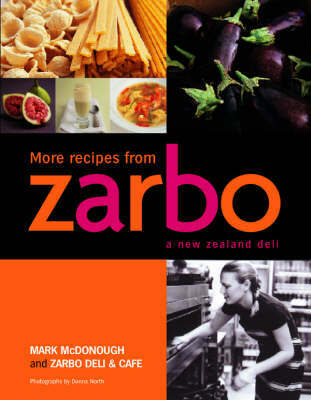 Following on from the success of his first book ZARBO: RECIPES FROM A NEW ZEALAND DELI, Mark McDonough brings us MORE RECIPES FROM ZARBO, another collection of mouthwatering recipes from Zarbo Deli and Cafe, combining fresh produce with interesting imported deli products. With an emphasis on mixing and matching and using the recipes as a base to work from, this book contains a great section on entertaining and assembling of platters and finger food, as well as new recipes for main meals, light meals, salads and desserts. Donna North makes a return in MORE RECIPES FROM ZARBO, bringing us more stunning food and ambient environment photographs. Examples of recipes are: *Kumara, coconut and ginger salad *Asian chicken salad with lime and kelp pepper dressing *Roasted red pepper, chorizo and smoked paprika soup *North African chicken tagine *70% chocolate ginger cookies Mark McDonough is the owner of the thriving Zarbo Deli and Cafe in Newmarket, Auckland. Entrepreneurial, with a flair for what tastes good, Mark is constantly devising new dishes for his restaurant, as well as catering for corporates, combing the world for interesting deli items to import, and producing his own range of Zarbo-branded products to sell throughout New Zealand, Australia, Asia and Europe. As well as catering for his appreciative clientele, Mark also cooks for his own young family, so while his dishes are creative and eclectic, he maintains that they are also easy, and above all quick.